Going to SOT in Baltimore? 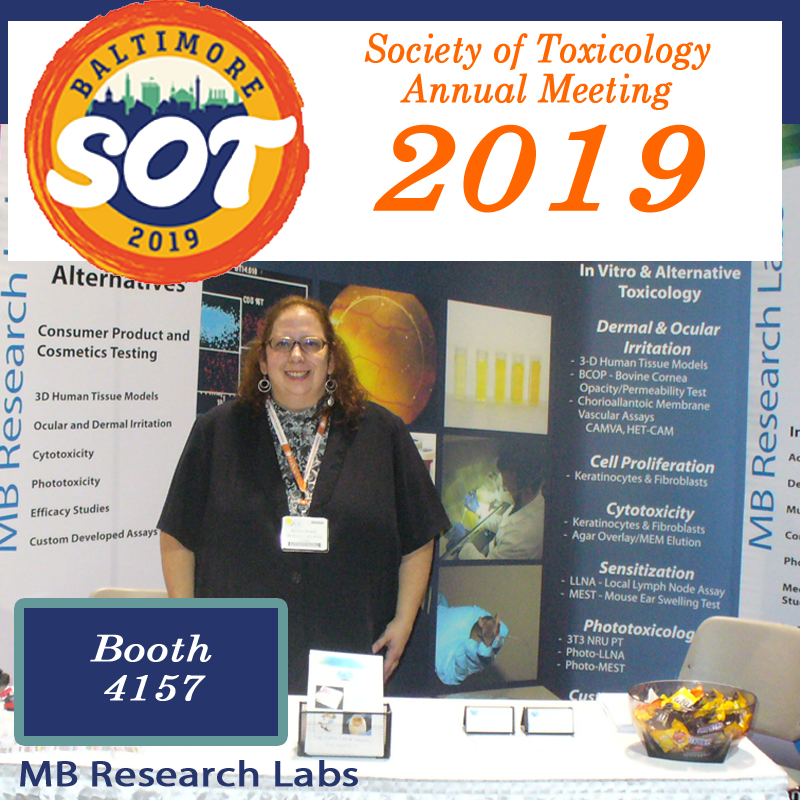 Stop by our Booth #4157 and get the latest on our Toxicology Testing and Research Portfolio. Ask us about our newest addition, the GARD™ Sensitization Testing Platform. We are honored to be working with SenzaGen and offer this set of novel genomic based assays for sensitization. We will also be presenting scientific posters on the rest of our research at MB. Check out our special webpage on our SOT activities. PorCORA – Corrosive or Severe Eye Irritant? The Draize Rabbit Eye Test (DRET) is the regulatory ‘Gold Standard’ for assessing and categorizing ocular irritation/corrosivity. The DRET focuses attention on damage to a number of different ocular structures, which are scored and weighted based on toxicological importance. The structures are as follows: Cornea (CO) – 80 points, Conjunctiva (Conj) – 20 points, and Iris (IR) – 10 points. The heaviest weighting is on corneal damage, which is 80 points out of the total 110-point scale devised by Draize. Corneal irritation scoring is based on assessment of opacities on the cornea, Conj irritation is assessed by increased vascularization, and iridial damage is assessed by function of the iris (ability to constrict or dilate pupil)and deepening of the rugae. Since the CO scores have the heaviest weight, and most often are the drivers of eye irritation, we developed the Porcine Cornea Opacity Reversibility Assay (PorCORA), an ex vivo corneal model. The PorCORA can distinguish between a material’s potential to cause severe (reversible) versus corrosive (irreversible) damage. 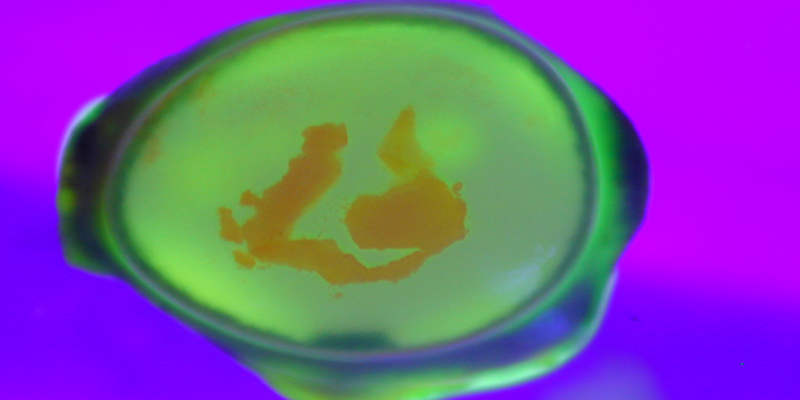 Excised cultured porcine corneas are topically dosed with a test material and kept in culture for 21 Days. Corneal damage is visually assessed and scored. If CO reverse and are not visible by Day 21, the test material is categorized as a non-corrosive material and deemed to not cause permanent ocular damage. In internal validation studies, we tested 56 chemicals and dilutions of chemicals ranging from corrosive (GHS category 1) to non-irritating (GHS not categorized). Using Cooper Statistics, we arrived at an accuracy of 89% with a positive and negative predictivity of 85% (cat. 1) and 93% (not cat.1), respectively. To determine if these Cooper Statistics could be improved, we used the drivers of classification concept based on Barroso et al., 2016*. Upon re-examination of our data based on this published database and methodology, we found that four chemicals (1,2,4-Triazole, N-Butanol, 2,5-Dimethyl-2,5-Hexanediol, and Potassium Cyanate) had invalid tests (animals euthanized prior to day 21) or produced irritation not driven by corneal opacities. These chemicals were removed from our dataset. Without these four chemicals the accuracy improved to 92%. Moreover, the major change was in our positive predictivity, which increased to 91%. The negative predictivity for this subset of chemicals remained the same. Lastly, PorCORA’s predictivity was assessed based on CO persistence; i.e., materials that produced low CO scores (from Draize Rabbit Eye Tests). Of the 56 chemicals tested, 40 had low severity (i.e., CO mean scores < 3). The accuracy for persistence of low CO scores was 88% with positive and negative predictivity of 79%, and 92%, respectively. * Barroso, J., Pfannenbecker, U., Adriaens, E., Alépée, N., Cluzel, M., De Smedt, A., Hibatallah, J., Klaric, M., Mewes, K., Millet, M., Templier, M., McNamee, P. 2016. Cosmetics Europe compilation of historical serious eye damage/irritation in vivo data analysed by drivers of classification to support selection of chemicals for development and evaluation of alternative methods/strategies: the Draize eye test Reference Database (DRD). Arch. Toxicol. 91:521-547. Based on these data, the PorCORA was proven to be a valid test to assess a material’s potential to distinguish reversible versus irreversible eye damage. Appropriate choices of validation chemicals, based on the drivers of classification, have proven valuable and should be applied to replacement ocular assays that previously failed to meet acceptance criteria. If you would like to find out more about PorCORA and other in vitro/alternative toxicology testing methods, please click here. Safety evaluation of cosmetic ingredients is based upon the testing principles of the risk assessment process most typically applied to chemical substances. The regulatory drive of Cosmetic safety is driven by the Federal Food, Drug, and Cosmetic Act (FD&C Act) and the EU Regulation 1223/2009. The FD&C Act prohibits the marketing of adulterated or misbranded cosmetics in interstate commerce and EU Regulation 1223/2009 aims to protect human health, reduce and regulate animal testing as well as make information more available to consumers, leading to the introduction of the product ingredient file concept. In 2013, the European Union (EU) enacted the Directive 76/768/EC, the primary law that outlines cosmetics safety requirements. This Directive includes the 7th amendment which mandates prohibition of animal testing for cosmetic products and ingredients. In accordance with European regulations, a Product Information File (PIF) must be authored for each cosmetic product and submitted to the competent authorities on demand. MB Research Labs has been the premier choice in conducting product safety assessments for the cosmetics, personal care, chemical and pharmaceutical industries for over 45 years. Our expertise is sought out to ensure the safety our partners’ cosmetic ingredients. MB Research is a leader in the use and development of In Vitro and Alternative Toxicology Tests and continue to introduce new testing methods regularly. MB Research Labs is honored to be attending the 10th World Congress on Alternatives and Animal Use in the Life Sciences. We will be presenting several posters focusing on the use and development of in vitro and alternative toxicology methods that are used in our laboratories. Poster: M-A45 – The Human Cell Line Activation Test (h-CLAT) for Assessment of Dermal Sensitization Potency of Commercially Available Mixtures and the OECD Proficiency Chemicals. Poster: M-A27 – In Vitro Co-Culture Assay for Identification of Dermal Sensitizers. Poster: T-B119 – Historical Performance of Weak Sensitizers in Different Animal Models. Poster: W-C84 – Use of the Porcine Corneal Opacity and Reversibility Assay (PorCORA) for Testing Detergent and Cleaning Products Identified as In Vivo Category 1 (Cat. 1) Due to Persistence of Ocular Tissue Damage According to the UN Globally Harmonized System (GHS) of Classification. More Information on In Vitro and Alternative Testing…. to predict across the entire range of irritation for different chemical classes. Several labs (including MB Research) have been working on strategic combinations of several in vitro and alternative test methods within a (tiered) testing strategy that could replace the Draize Rabbit Eye Test. 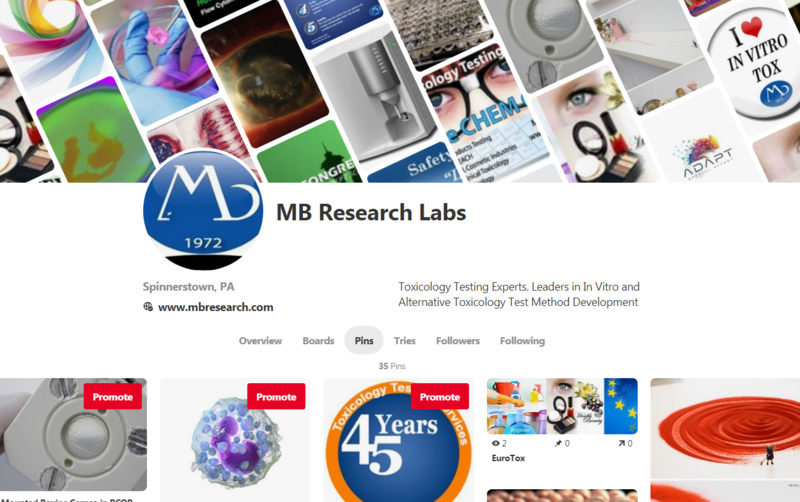 For more info on in vitro and alternative toxicology methods, please see: www.mbresearch.com.